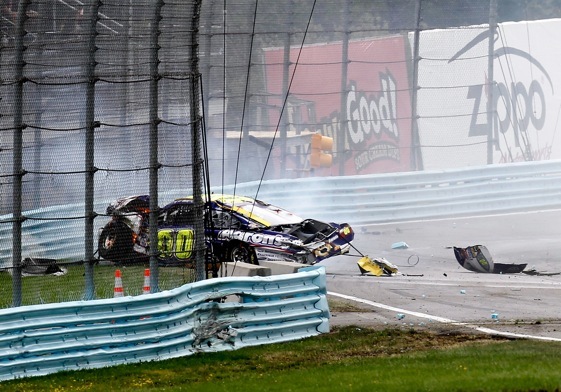 A scary wreck just after the mid-point of Sunday’s Sprint Cup Series race at Watkins Glen International brought out loud and sometimes angry calls for improved safety measures at the aging New York road course. The wreck occurred on Lap 55 of the 90-lap event. As the field came out of the Carousel portion of the track, the cars of Greg Biffle and Ryan Newman touched. Newman’s car careened out of control and slammed the steel armco barrier and bounced back onto the track. Newman’s car was then slammed by that of Michael McDowell. McDowell’s car then slammed the armco and tire barrier on the other side of the track. Both cars were ripped to pieces. The steel barriers were also ripped up and it took a long red flag stoppage to fix them. Neither driver was seriously injured. Upon emerging from the infield care center, Newman ripped into the track and what he feels are unsafe conditions. “It’s real disappointing,” he said. “The SAFER barriers, that doesn’t exist here. The there’s no concrete walls (upon which the SAFTER barriers are attached). It’s just a antiquated race track and the safety is not all up to NASCAR standards. It’s a shame we have to have accidents like that to prove it. The location of the wreck has been the scene of several other scary incidents over the years. The track has been reconfigured in the area but apparently it still remains a highly dangerous portion of the track. “There have been a lot of big wrecks in that area,” six-time Cup champion Jimmie Johnson said. “One thing I would say is, I know it’s a road course and it’s hard to get concrete structure around the race course, but armco barriers just aren’t the best thing for these big heavy cars. That’s an area I would look first of all. Johnson’s Hendrick Motorsports teammate, Jeff Gordon, was involved in an equally scary wreck at the same place on the track a couple years back. He too slammed hard into a barrier. AJ Allmendinger, a road racing veteran from his days in Champ Car, agreed changes are need to the area in question at The Glen. Dale Earnhardt Jr. said the situation is very dangerous, especially when the cars are bouncin off the armco and tire barriers back onto the track. And he said he would love to see concrete and SAFER barriers where the wrecks have taken place. NASCAR vice president of competition Robin Pemberton addressed the situation on television. He said improving safety “is an on-going process” and cited several improvements which have been made at The Glen. The Glen’s PR problems continued into the final laps when, with a great battle developing between Allmendinger and Marcos Ambrose building to a climax, a wreck which saw Denny Hamlin hit sand barrels near pit-in brought out another long red flag for cleanup. All in all, it was a long, dismal day for one of America’s most iconic race tracks.